Welcome to the Artistic Outpost Design Team August Blog Hop! 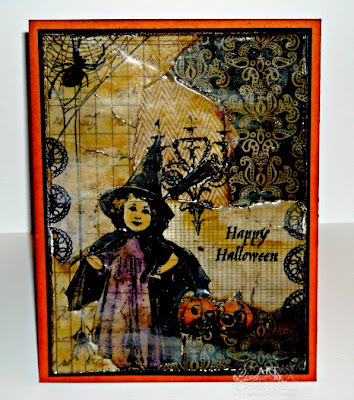 Each month, the fabulous designers at Artistic Outpost showcase projects created with various Artistic Outpost Plates/Themes, this months DT Blog Hop theme is Halloween. I created a Mixed Media card using stamps from the Artistic Outpost Vintage Halloween and Gothic 31 plates along with paper from My Minds Eye. I randomly adhered the MME pattern paper with Gel Medium to a piece of Mixed Media paper. Then stamped bits of images in Ranger Black Archival Ink. The sweet witch and pumpkins are from the Vintage Halloween plate. The images are stamped on a scrap of pattern paper, then colored with STAEDTLER Aquarell Watercolor Pencils, and adhered to the background with Gel Medium. To tone down the background I added some white-washed Gesso, then used the Cracked Glass Technique over the entire panel. I'm lovin' that torn background too and great work with the cracked glass technique. The little witch is adorable! Very cool card, Lisa. Oh that background...awesome texture and shine!!! Love that witch! Love the mix of elements with the papers, the gloss, and the images! Eerily beautiful! Love the ghosty effect you created with the gesso wash, and sealing it all was genius. Wonderful mix of papers and mediums you used for that amazing background! Love that sweet little witch! The cracked glass finish is brilliant! Wonderful papers, and they look so amazing with the Cracked Glass glossiness. I adore that little witch! I love this, the cracked glass looks awesome. Wow! Great background with the various patterned papers and that glossy overtone. A wonderful, vintagy card. This is such a neat card that I don't know where to start or end! It's really cooool! I love all of the things you've used and the techniques you've employed! Just awesome! Thank you for sharing! Great mixed media piece, Lisa! Very creative. I too love the cracked glass technique. I jist have to buy the little witch stamp!! She is precious.